PKR.com is known for one thing in the online poker world - their stunning 3D poker software. The site is not USA friendly, but PKR offers a $800 sign up bonus, easy to beat competition, and Mac compatible software. If there's one thing that sets PKR Poker (www.PKR.com) apart from the rest of the online poker world, it has to be their awesome 3D poker software. The graphics and game play are simply stunning, and are as close to physically entering a live poker room as you can get on a computer. From the meticulous features of each avatar, to the background scenery and decor, the developers of the PKR poker client paid very close attention to every single detail. Aside from the graphics, the software itself is highly functional and runs quite smooth on any computer built in the past four or five years. On the downside, PKR Poker has limited game variety and US players are not accepted. The poker lobby offers vital stats like viewed-flop %, average pot size, and hands per hour. Players can classify their opponents for future reference and view personal stats in play. The hand history function is very comprehensive, allowing players to view their personal hands or that of the entire table throughout a session. Multi-tabling allows up to four simultaneous ring games with a good mini-view function and resizable tables. 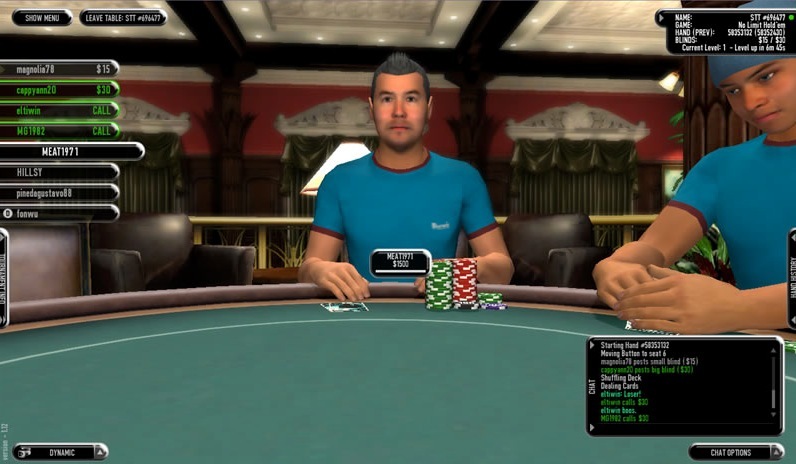 The most unique feature of PKR is the ‘Emote Control System' (ECS), which allows players to instruct their avatars to exhibit various real-life actions in the 3D poker environment. For example, you can actually "peek" at your hole cards, just like the pros. Extra ECS mannerisms and avatar add-ons, like bracelets and other exclusive gear, can be won at PKR Poker's special tournaments. Learn how to download PKR poker. PKR offers promotions including their sign up bonus, six freeroll tickets, and their refer-a-friend program. After you deposit, your deposit money will show up in your cashier, and your bonus money will be held in a separate account until you "clear" the money. To clear the money you must earn 225 PKR Points per $1 of bonus money. The bonus is a lump sum, so if you redeem the full $800 bonus, you will have to earn 180,000 PKR Points before you release the full bonus. The bonus expires sixty days after your first deposit. PKR offers another first deposit bonus which is worth 100% up to $2,000. Because the bonus is so large, players have to send in a few items to prove their identity before making the large deposit. Once you have met the requirements, use bonus code PSITE2000 to redeem the bonus. Learn more about the $2,000 PKR bonus. PKR also rewards all new depositors with six tickets to weekly PKR premium freerolls. These freerolls run every week, and are only open to new depositors with an entry ticket. The $1,000 freerolls are a great way to boost your bankroll immediately after your first deposit. PKR also offers a refer-a-friend program that rewards players with $50 every time they refer a qualifying player to PKR.com. To redeem the bonus, create an account at PKR.com and enter your friends' emails in the referral form. Your friends will then receive an email with instructions on how to sign up at PKR. If your friends sign up, make a deposit of at least $50, and earn 1,000 PKR points, you will receive a $50 deposit into your account. Your friend will get $50 free too! PKR doesn't have the widest variety of poker games, but they offer a solid lineup with good traffic across the board. The most popular game at PKR is No Limit Hold'em, and the site offers the game in limits ranging from $0.01/$0.02 up to $100/$200, but at the time of this writing the biggest NL Hold'em game running is $10/$20. PKR also offers Pot Limit and Fixed Limit Texas Hold'em, Omaha, and Omaha Hi-Lo, but the player traffic is significantly less for these games. PKR has yet to add Seven Card Stud or other poker variations, but we expect more additions to the lineup in 2010. PKR also offers play money tables if you would like to practice before depositing. Table sizes include heads up tables, shorthanded tables, and full-handed tables. As far as player competition goes, we believe PKR is one of the softest online poker sites, because many players sign up for the cool graphics without even knowing how to play poker. Besides the larger tournaments listed above, PKR also holds smaller tournaments every day with buy-ins as small as $0.50. Also, freerolls are a big draw at PKR Poker, especially for new members who have tickets to the $1,000 premium freerolls. Most freerolls at PKR have a small prize pool and a large field, but extremely loose competition. Regularly scheduled tournaments have buy-ins ranging anywhere from $0.50 to $530, with the juiciest tournament action of any online poker room. I've developed my own theory as to why this is - the most skilled online poker players are in it for the profit, choosing an online poker room with the least graphical interference and table clutter, while the inexperienced love the amazing graphical side PKR offers. PKR TV is a cool way to get players pumped up for specific poker tournaments, because even small stakes players have a chance to be a star on television. Sign up at PKR.com to start playing PKR TV tournaments! PKR Poker rewards its players with PKR Points for every hand played where rake is contributed. Players can actually earn up to 150 points in a single hand. Tournament fees rewards PKR Points at a rate of 100 per $1 in fees. Points can be used in numerous ways, all beneficial to members of the online poker rooms. Points can earn you a seat in various Freeroll competitions; they can be traded for real merchandise, or used to purchase in-game apparel, gear and extra ECS mannerisms for your avatar. The more points a player collects, the higher they will climb the VIP ladder, respectively awarding points at an even higher rate. PKR Poker also offers an in-depth online poker school that helps to educate players from Beginner levels, to Intermediate, and then Advanced. No matter your current level of game play, there's surely something in the PKR Poker School that will help to hone your poker tournament and ring game skills. PKR has a professional and knowledgeable support team that can be contacted via Live Chat or email. We recommend using Live Chat, because it is just as fast if not faster than a phone call. Here are the options PKR uses for processing deposits and withdrawals. NETeller, Click2Pay, Visa, MasterCard, Maestro, Switch, Solo, Moneybookers, iDeal/Bank Transfer, Entropay. NETeller, Click2Pay, Visa, MasterCard, Maestro, Switch, Solo, Moneybookers, iDeal, Entropay, Check. Thank you for reading our review of the PKR poker room. If you liked what you read, make sure to visit PKR.com to get started. Remember that PKR offers stunning 3D poker software, a big $800 sign up bonus (or $2,000 if you want), and easy to beat competition. If you sign up, make sure to use bonus code PK800 to redeem your 100% up to $800 sign up bonus along with the $1,000 freeroll tickets.